You saw my first Retro Camper back in September when I shipped it off for the Home Sweet Home mini swap. I couldn't resist making myself a copy. It's mostly identical to the first. Since I hadn't received it yet when I posted the mini I made for Brittany, here's the adorable, colorful neighborhood mini that she made for me! Posted in Quilting. 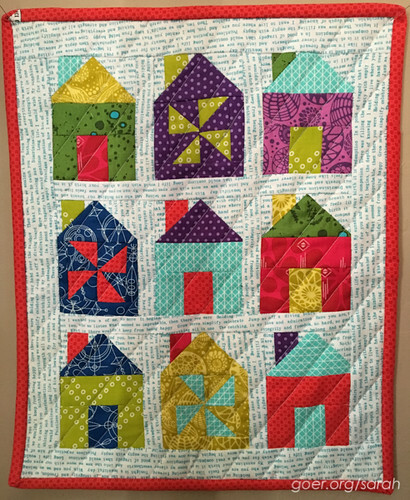 Tags: finished quilt, mini quilt on December 27, 2015 by sarah. That camper is so adorable. Love the background print. I love the retro quilt block. 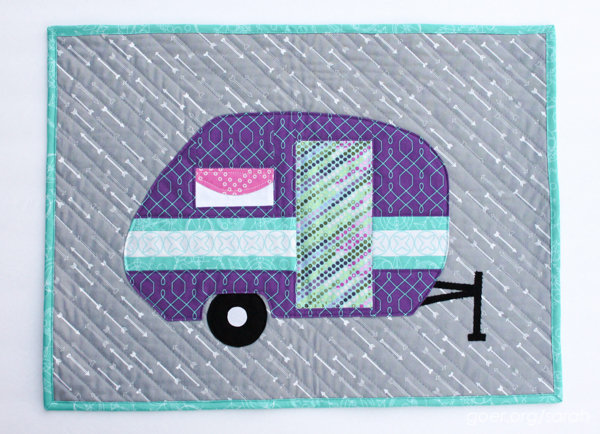 My late husband and I had a trailer like this, so I just may make a mini quilt using this idea. It would be a great way to remember our trips. Thank you, Darlene. I'm not sure if you saw my other post about my design, but I pieced all the sections and then I cut out the whole shape (to minimize the amount of appliqué in the project).